It may look sinful, but it’s not, thanks to the addition of white whole wheat flour, lemon extra virgin olive oil, honey, yogurt, and fresh berries. This lightly sweetened bread is divine toasted and buttered for breakfast or simply enjoyed as a light snack. Preheat the oven to 400 degrees. Grease or line muffin cups or miniature loaf pans. In a large bowl, mix together the dry ingredients. In a separate bowl mix the wet ingredients and lemon zest. In three separate additions, add the wet ingredients to the dry, scraping down the bowl. Gently fold in the berries. Fill the muffin cups or loaf pans half way with batter. Bake in the center of oven for 20-25 minutes until a tester inserted in to the middle comes out clean. 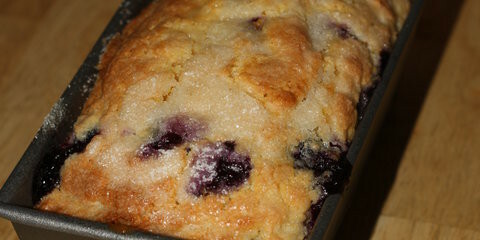 Makes 18 standard size muffins or one dozen muffins and one large or two miniature loaf pans.